← Have You Caught ‘The Writing Bug’? What can we learn from Roger Hargreaves, creator of Mr Men & Little Miss books? Happy Birthday to Roger Hargreaves; creator of the Mr Men and Little Miss series of children’s books! As a child I loved these books, and as a mother I loved reading them to my child. The Mr Men and Little Miss series of books are a great example of books that stand the test of time. They are also a great example of ‘book branding’ – knowing exactly what type of books you write, how they are unique, and what recurring themes are present in your books. In this case, each book illustrates a dominant personality trait or feature that helps create the story within the book (eg: Mr Brave, Mr Chatterbox, Little Miss Bossy, Little Miss Late…etc). Each book stands alone but is linked to all the others through the title and theme. Why is this brand ing or recurring theme important? It helps readers identify the books, and if they have enjoyed one of your books, it provides a sense of expectation and anticipation about future books. For authors, it helps in the placing and promoting of your book in the market. Also, if you have something linking each of your books, it helps in coming up with new ideas, because there is already a starting point of some kind. These links might be in having similar titles, characters, themes, or locations. For example, an author’s book titles might all be from song lyrics, or a twist on a classic fairytale. I have also seen authors use letters of the alphabet, colours, seasons, and names as a way to define their books. Characters might reappear in future books, or future books might focus on secondary characters from the previous books. Each book might involve different characters from the same town or location, or each book might address similar themes and life issues, such as family relationships, stories of revenge, or stories of women standing on their own two feet after a major life challenge. The books I write in the genre of women’s fiction are all about new beginnings; a character, or characters, undergoing a major change that results in them starting a new life path. In addition, I am playing with the idea of using ‘different months of the year’ to link each of my books. ~ Juliet, aka: Little Miss Busy, Late, Stubborn, Quick, and Fun all rolled into one! 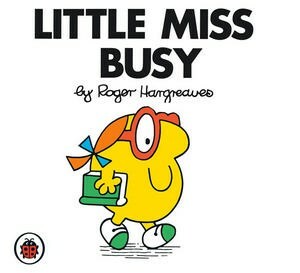 Posted on May 9, 2011, in General, Writing and tagged books, branding, craft, little miss, mr men, roger hargreaves, themes. Bookmark the permalink. 2 Comments. Great post, Juliet. I’ve loved Mr Men books ever since I can remember and they are a great example of branding. Inspiring post.